I often have occasion to think that, as an “intellectual,” I’m very lucky to be alive at this time in history, at the end of the long evolution from Herodotus and the pre-Socratic philosophers to Chomsky and modern science. The main reason is that, if one has an open and critical mind, it is possible to have a far more sophisticated and correct understanding of the world than ever before. Intellectual history is littered with egregious errors, myths and lies that have beguiled billions of minds. Two centuries after the Enlightenment, however, the spirit of rationalism and science has achieved so many victories that countless millions have been freed from the ignorance and superstition of the past. 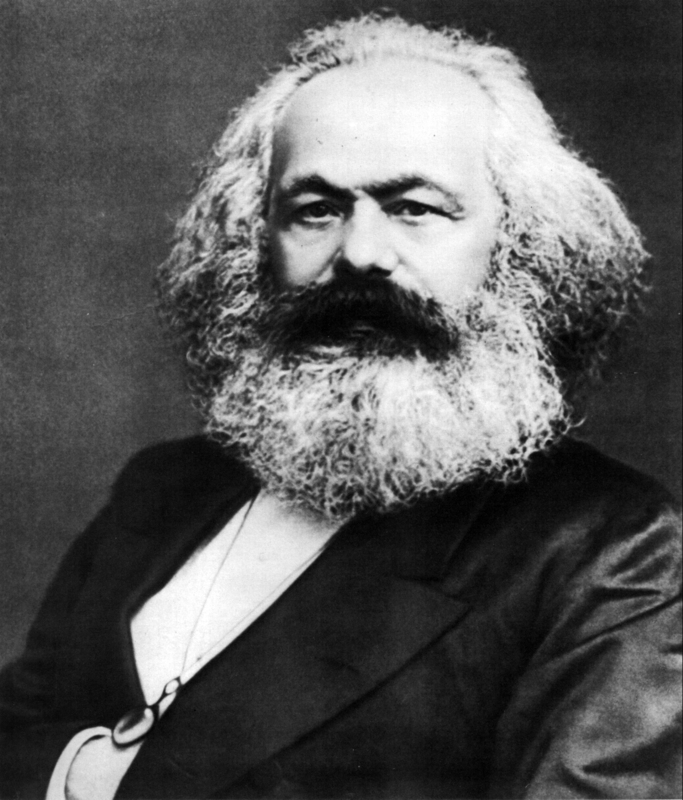 Few thinkers deserve more credit for the liberation of the human mind than Karl Marx. Aside from the heroes of the Scientific Revolution—Copernicus, Galileo, Newton, Boyle, a few others—and their philosophical ‘translators’—Francis Bacon, Descartes, Spinoza, Voltaire, Diderot—hardly any come close. But not only did Marx contribute to our intellectual liberation; he also, of course, made immense contributions to the struggle for liberation from oppressive power-structures (a struggle that, indeed, is a key component of the effort to free our minds). These two major achievements amply justify the outpouring of articles on the bicentennial of his birth, and in fact, I think, call for yet another one, to consider in more depth both his significance and his shortcomings. These simple, commonsense reflections suffice to establish the meaning and validity of Marx’s infamous, “simplistic,” “reductionist” contrast between the economic “base” and the political, cultural, and ideological “superstructure.” Maybe his language here was misleading and metaphorical. He was only sketching his historical materialism in a short preface, the Preface to his Contribution to the Critique of Political Economy, and could hardly have foreseen that generations of academics would later pore over his words, pick at them, cavil at them, fling casuistries at each other until a vast scholarly literature had been produced debating Marxian “economic determinism.” As if the relative primacy of economic institutions—which is to say relations of production, class structures—that are, by definition, directly involved in the accumulation and distribution of material resources and thus power, isn’t anything but a truism, and can be seen as such on the basis of such elementary reasoning as in the preceding paragraph. Question: But you're often accused of being too black-and-white in your analysis, of dividing the world into evil élites and subjugated or mystified masses. Does your approach ever get in the way of basic accuracy? Answer: I do approach these questions a bit differently than historical scholarship generally does. But that's because humanistic scholarship tends to be irrational. I approach these questions pretty much as I would approach my scientific work. In that work—in any kind of rational inquiry—what you try to do is identify major factors, understand them, and see what you can explain in terms of them. Then you always find a periphery of unexplained phenomena, and you introduce minor factors and try to account for those phenomena. What you're always searching for is the guiding principles: the major effects, the dominant structures. In order to do that, you set aside a lot of tenth-order effects. Now, that's not the method of humanistic scholarship, which tends in a different direction. Humanistic scholarship—I’m caricaturing a bit for simplicity—says every fact is precious; you put it alongside every other fact. That's a sure way to guarantee you'll never understand anything. If you tried to do that in the sciences, you wouldn't even reach the level of Babylonian astronomy. I don't think the [social] field of inquiry is fundamentally different in this respect. Take what we were talking about before: institutional facts. Those are major factors. There are also minor factors, like individual differences, microbureaucratic interactions, or what the President's wife told him at breakfast. These are all tenth-order effects. I don't pay much attention to them, because I think they all operate within a fairly narrow range which is predictable by the major factors. I think you can isolate those major factors. You can document them quite well; you can illustrate them in historical practice; you can verify them. If you read the documentary record critically, you can find them very prominently displayed, and you can find that other things follow from them. There's also a range of nuances and minor effects, and I think these two categories should be very sharply separated. When you proceed in this fashion, it might give someone who's not used to such an approach the sense of black-and-white, of drawing lines too clearly. It purposely does that. That's what is involved when you try to identify major, dominant effects and put them in their proper place. On the bicentennial of Marx’s birth, it’s intellectually shameful (though predictable) that idealism is still the primary tendency in scholarship and journalism. I’ve criticized bourgeois idealism elsewhere, for example here, but it is worth discussing again because of how dominant it is, and how damaging. In these beliefs they were mistaken. The social revolution can’t occur after a total seizure of state power by “the proletariat” (which isn’t a unitary entity but contains divisions)—for several reasons. First, this conception of revolution contradicts the Marxian understanding of social dynamics, a point that few or no Marxists appear ever to have appreciated. It exalts a centralized conscious will as being able to plan social evolution in advance, a notion that is utterly undialectical. According to “dialectics,” history happens behind the backs of historical actors, whose intentions never work out exactly as they’re supposed to. Marx was wise in his admonition that we should never trust the self-interpretations of political actors. And yet he suspends this injunction when it comes to the dictatorship of the proletariat: these people’s plans are supposed to work out perfectly and straightforwardly, despite the massive complexity and dialectical contradictions of society. 1. In my summary of G. E. M. de Ste. Croix’s 1981 masterpiece The Class Struggle in the Ancient Greek World, from the Archaic Age to the Arab Conquests, I added the following thoughts to the foregoing account: “Class struggle is central to history in still more ways; for instance, virtually by analytical necessity it has been, directly or indirectly, the main cause of popular resistance and rebellions. Likewise, the ideologies and cultures of the lower classes have been in large measure sublimations of class interest and conflict. Most wars, too, have been undertaken so that rulers (effectively the ruling class) could gain control over resources, which is sort of the class struggle by other means. Wars grow out of class dynamics, and are intended to benefit the rich and powerful. In any case, the very tasks of survival in complex societies are structured by class antagonisms, which determine who gets what resources when and in what ways." 2. In reality, of course, political and economic relations are fused together. But analytically one can distinguish economic activities from narrowly political, governmental activities.